The My Year in Status Facebook application has appeared in my News Feed quite a bit over the last few weeks. 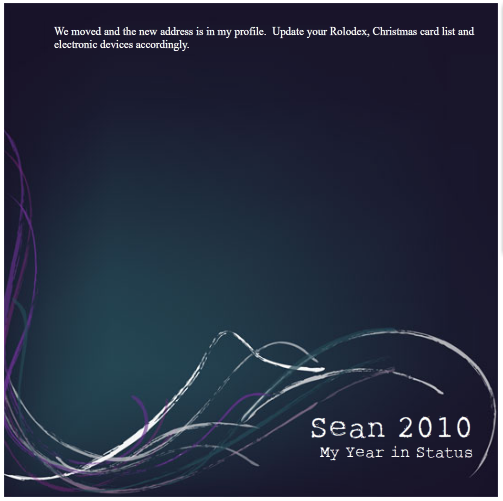 I am a sucker for “year in review” things, and was surprised by how many status updates some people did throughout 2010. I know I don’t post status updates on Facebook frequently so I was curious what my year in Facebook updates looked like. I wanted to do this covertly so I had my Privacy Settings for Applications, Games and Websites in one tab and my Facebook Profile open in another tab, ready to remove the application and any posts it made after it had generated my numerous updates into a single image. One update is all I made in 2010. I thought I was going to have a big blank page but it looks like I had something I wanted to tell the world about. Maybe in 2011 I’ll have no updates? You inspired me to do this myself as well. My results were also a treat, as I only updated facebook on the rarest of occasions, and stopped altogether around July. My year started out with things like “Gordon rocks his moustache with reckless abandon” or “_ just watched Iginla score a hat-trick for Team Canada in a Calgary bar”. Slightly later I meandered into “_ is 5-0-0 in the Starcraft 2 Beta” and “_ is selling an unlocked blackberry” and ended with the hint that I was leaving for Cuba on a last minute vacation. Not a bad half-year in review. But not as cool as a solitary update. Funny, I saw your image be created in my News Feed. If people were following your updates they would think you got drunk in a Calgary bar, sold your unlocked Blackberry to someone in Cuba and never returned. All in all, those updates were pretty telling for what happened in 2010.